The sight of a floating cooler is the harbinger of a good summer. The pool parties are going to frequent and you don’t want to miss out on all the fun by getting out of the pool due to drinks shortage. 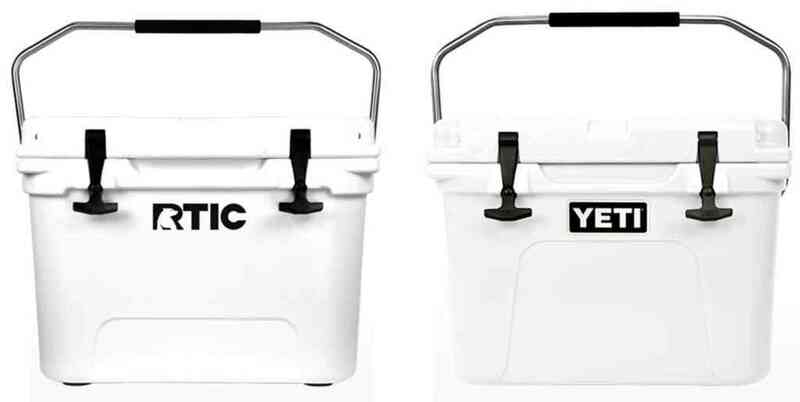 Well, there’s good news – Floating coolers as the name implies are used to stock drinks in a cooler boat so that you don’t have to go out of the pool to restock drinks when you run out of supply. This means you won’t miss out on the fun. 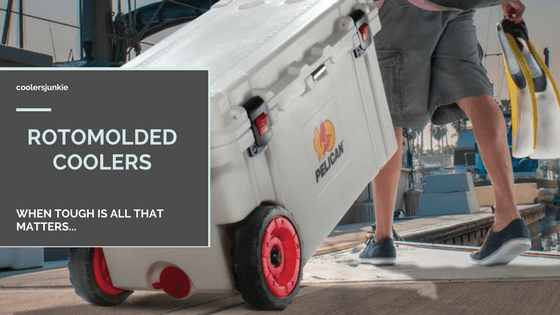 2 Floating Coolers – What to Look Out For! 2.2 Which Type Of Floating Cooler Is Best For Pool, River or Lake? Now you should know that no all these inflatable floating chests are good at their jobs. Floating coolers come in different sizes, design and float materials. There are many options out there and you might just be unlucky to choose the wrong product. But the silver lining is – here at coolersjunkie, our work is rid you of crappy products and hook you up with the best options. Of course, You are assured of picking a cooler will live a mark of great memories. Intext mega chill II is a stroke of genius from one of the leading inflatable cooler manufacturer in the game. If space is your problem, then consider it solved with the 48 quarts capacity base that can hold up to 72 cans of drinks plus ice. The cooler has 6 cup holders which come in handy to keep opened drinks you haven’t finished yet. 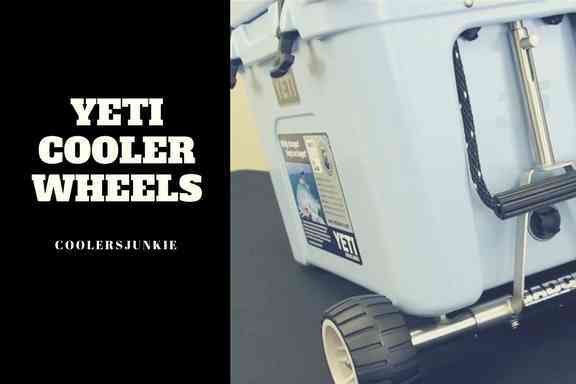 The cooler has 4 heavy duty handles. The lid is held down by Velcro tabs, although not completely detachable, the lid could be lifted up just enough to grab a drink. Don’t expect a miracle here. The build does little to improve ice performance but some users mentioned putting a rotomolded cooler directly inside. Try it out and tell us how well it works for you. Airhead watersports is an ice chest for those who want to continue having fun in perpetuity. It comes with many standout features, for me, this is perhaps one of the best inflatable ice chests you can find. One cool thing about the Airhead Watersports is the detachable cooler which can be separated from its base allowing you to restock the chest without having to remove it out of the water. Like the Intext Megachill II, it has 6 cup holders. Although lacking the intext capacity, it manages to give a 24 cans capacity. With a leak-proof nylon build, the cooler provides extra insulation for better ice periods. Don’t get your hope high as it doesn’t hold ice for long. The Airhead has a sundry holder which is great for storing your accessories. 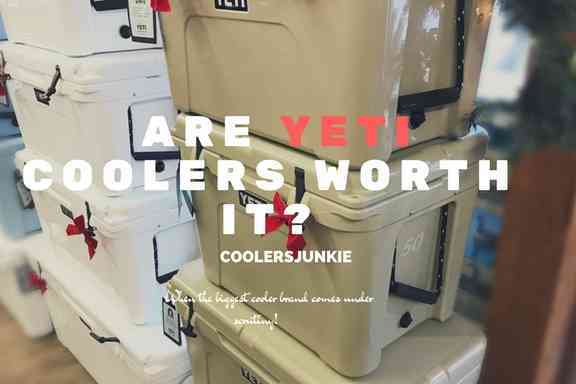 Overall, it’s a great inflatable cooler and if you want value for your money, the cooler is a product you should consider. The Amscan palm tree cooler is the type that’ll stick out like a sore thumb in the pool. Thanks for the artificial palm tree structure, your cooler is bound to get noticed by everybody. Quite big enough, it can hold up to 40 cans and still have enough space for ice. On the downside, the cooler is made from cheap materials. Don’t expect it to last for more than a summer. 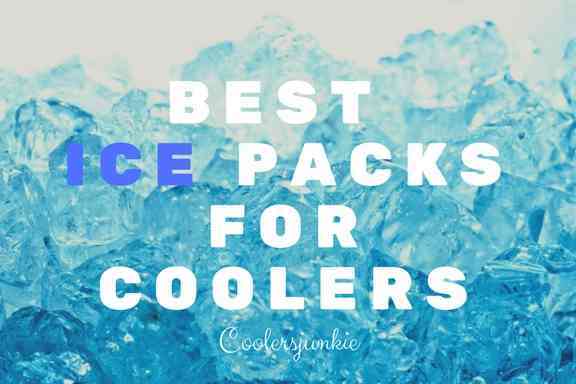 Unlike other coolers on the list, it doesn’t come with a lid. Ice performance is the last expectation you should have when buying the cooler. The interior of the swimways kelsyus is properly insulated to provide extended ice retention. Another great thing worth mentioning is the collapsible feature of the bag. When not it use the cooler folds neatly into a compact size. During the course of the party, drinks could get spilt in the bag. Thanks to the removable interior liner, it’s easy to wash all the stains and odor. It also has a dry storage compartment to store items you would not want to get mixed with drinks. Remember the intext mega chill we reviewed earlier? The intext river run II sport lounge is even better. Designed with user comfort in mind, it has two lounges meant for people to enjoy the company of each other. There’s an inbuilt cooler in between the lounge to keep drinks while you enjoy floating. It comes with 2 durable handles to provide stable comfort when seated upon. Additionally, it has a mesh bottom that’s designed to cool and provide comfy space for backrests. The cooler has a well thought out five air chambers to provide safety by trapping the air in. Overall, the River Run is among our favorites. Therefore, if you want an inflatable ice chest with our seal of approval, this is it. The creekkooler is the toughest cooler on the list. Injected with up to two inches of insulation, the manufacturers boast of a 48 hours’ ice retention. 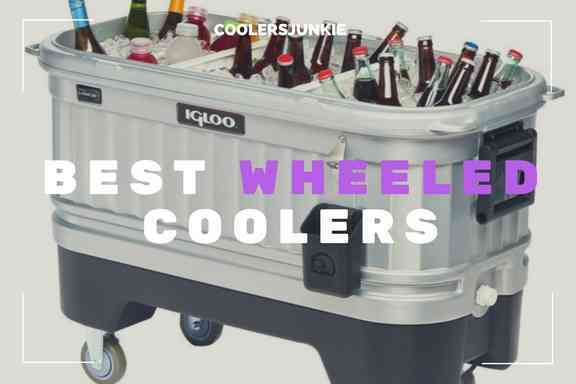 Despite the exaggeration, the cooler holds more than any floating cooler on the list. 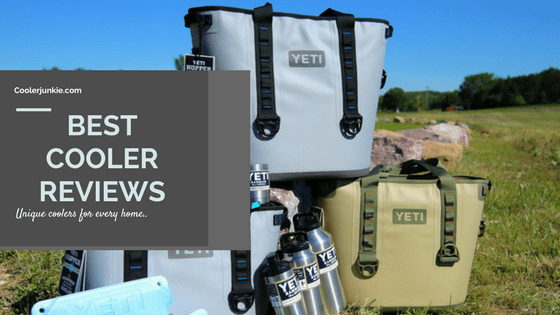 The design is obviously the highlight of the cooler, it features an o-ring design, with a locking lid and waterproof design, this cooler will stand the test of many summers to come. Besides, the only shortcoming of the cooler 30-quart size. Despite the space limitation, the creekkooler manages to hold up to thirty 12-ounce cans and 20 pounds of ice respectively. Fishermen will resonate with this cooler due to its fishing bobber shape. The byer 1700 big bobber floating cooler is the type that will wow people and executes its function effectively. It has an in-built handle which allows for easy carrying. 100% made in the USA you should expect nothing less but quality. You will appreciate the lightweight design as it allows it to float on water. How do you put drinks inside? Simply open the bobber and put drinks in the middle. Besides, there’s enough space to put ice as well. In for space? The cooler can holds only 12 cans which may be a turn off especially if capacity is the deal breaker for you. From Electric coolers with speakers to floating coolers with speakers, darn, technology is growing at an exponential rate. Don’t be surprised to see flying coolers in the next few years. That was a bad joke, back to business. The highlight of the cooler is undoubtedly the design; a topic people would likely discuss in the pool. The body glove music station is a floating cooler, the best part it has speakers. On the downside, the cooler does not have Bluetooth connectivity, you can only use a memory card to enjoy music. The thing is if you are buying this to replace your woofer, then you will be let down to know the sound isn’t as loud as clear compared to quality woofers. This cooler looks like the black pearl in the Pirates of the Caribbean. The pirate’s flag and the pointed tip will make you relive the pirate themed pool events in many years to come. The beistle has enough space to hold up to 72 cans, as if that’s not enough, there’s also enough space to put ice. The best part the beistle pirate ship even when it’s not used in the pool, kids can still use as a toy. Ahhqua bar allows up to four people to float on it. made of PVC Vinyl, the company boasts of the ahhqua to hold 200 pounds! Considering the weight it could carry, you’ll be surprised it weighs only two pounds. Designed with four sunseats with a cooler built-in the middle – anybody sitting can extend a hand to grab a drink. The best part is the cooler has a 90 days’ warranty after the purchase. That means you don’t have to worried about manufacturing defects cause you can return the product in exchange for a new one. Asides that, three cup holders are embedded between each seat. Coming with a repair kit with two adhesive patches, you can easily fix any leakage. Just like the Ahhqua bar we reviewed about, this index pacific product provides a four sitter floating cooler with better comfort, quality and inadvertently steep price. The cooler provides a sitting space and a pad to put your back. Just four seats are provided but a user said up to 8 adults were put in it and nothing happened. While it may be a good testimony, it would be wise not to overload it as it could tip over. 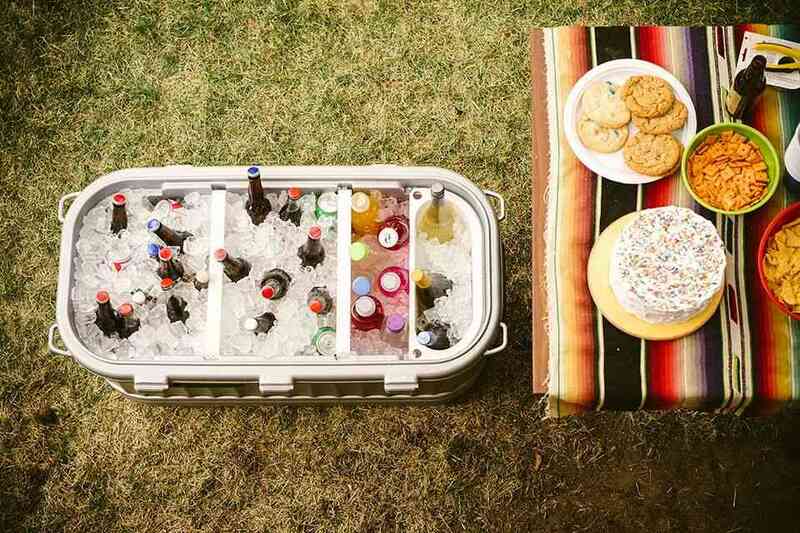 With cup holders on the edges, this is the perfect floating ice chest to enjoy the summer break. Floating Coolers – What to Look Out For! It’s summer and more than ever you need a floating cooler to enjoy pool parties. The highlight of having a floating cooler saves you from the inconvenience of getting out of the pool to restock drinks. Okay, any floating cooler would suffice, right? There are some key factors to look at for before buying one of these inflatable ice chests. Floating chests should be made of lightweight materials enough to float effortlessly without intervention from their owners. The sad truth about most floating coolers is that they aren’t made with high-quality materials. So to enjoy using your cooler in the foreseeable future, get the type that will stand against the menace of the crashing waves. 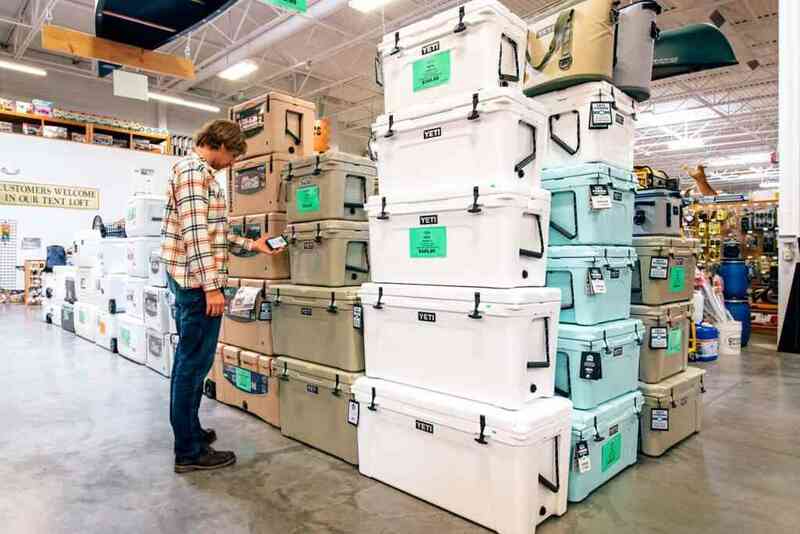 Most coolers with closed tops which seal well will have fewer chances of splashing waves getting inside the cooler, thus, saving it from sinking and reduced ice life. Another thing to consider is a cup holder, although trivial, it can make or break your experience when using a floating chest. A cup holder will enable you to keep your beverage down instead of putting it back it the cooler. 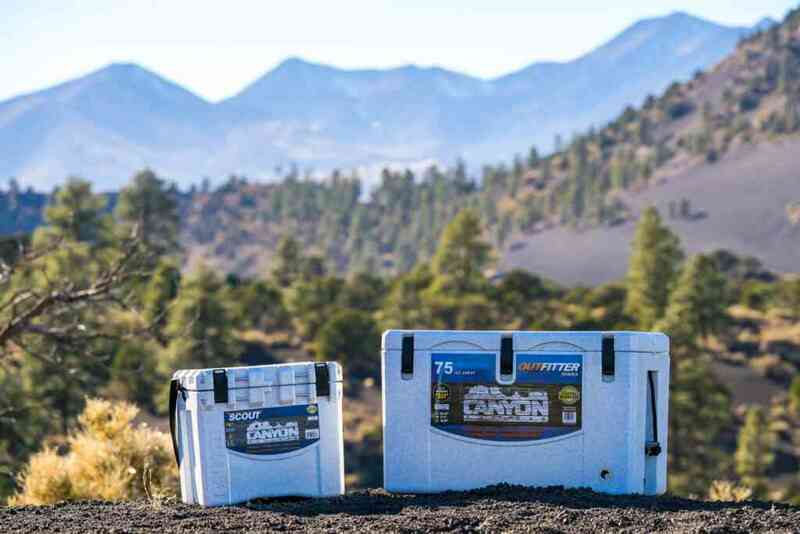 In all, a good cooler should have hard sides to be able to withstand the caprices of open water. Which Type Of Floating Cooler Is Best For Pool, River or Lake? Floating coolers aren’t just restricted to pools. Some may deploy them for lakes, river etc. therefore, it’s very important to know the ideal option for each use. Pools aren’t exposed to caprices as lakes and rivers. Thus, you can go for the cheap option. Don’t expect these types of cooler to last, the materials used in them are somewhat substandard. To get all these features, of course, you have to spend a bit more than what the average floating cooler cost. Take it as an investment in better products that will last longer. 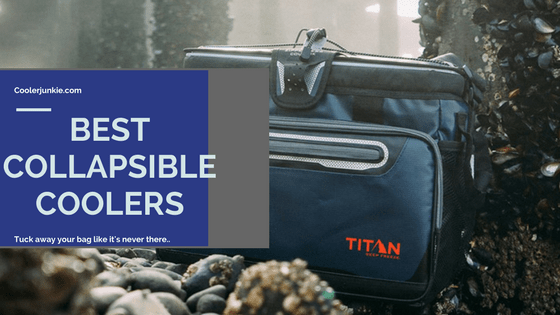 As you can see from these best floating cooler reviews, there are so many types, design and models out there. You may likely be spoiled for choice. The good thing is you want the best options in the market, we’ve made some great suggestions for you. Whatever you choose, keep in mind coolersjunkies hook you up only with the best option out there tested and reviewed by first-hand users.